Black Feminisms Forum make their statement to AWID's International Forum. This article is part of 50.50's in-depth coverage of the 2016 AWID Forum held on 8th -11th September 2016 in Bahia, Brazil. This year, the year the United States of America may elect its first female president, we will hear more about glass ceilings than perhaps any other time. But at the 13th AWID International Forum, with so much emphasis on shared movements and the ‘politics of friendship’, our focus was not on the barriers a woman breaks in her ascent to the ‘top’ of society, but on how we feminists reorganise society together. It is no wonder that the viable candidate to become the first female President of the United States is white. Or that the first Black President was a man. When the United States has had its first woman President, the glass ceiling will have shattered; but how long will it take for a Black woman to be elected to that office? And if the dual barriers will have been broken, then why will Black women be left sweeping shards from the floor – be they shards of metaphorical ceiling or the very real destruction which results from poverty or war? It is what Kimberlé Crenshaw might call an ‘intersectional failure’. Within the field of management studies, Karen Ashcraft refers not to glass ceilings but to glass slippers. This is the ‘fit’ of certain identities to certain occupations, which influence and are influenced by social norms (for example, ‘Mr. President’). The person who fits the glass slipper may look a particular way but may also have less visible attributes like cultural capital. In this vein, we might think less about individuals breaking through the glass ceiling, and more about us collectively smashing the glass slipper which encourages conformity to normative ideas and ideals. Sometimes we talk about ‘marginalised’ identities, or people who are disadvantaged by normative power structures. By implication, there is a ‘centre’, a location of power, which those on the outskirts desire to reach. The trajectory follows ‘margin’ to ‘centre’, disadvantage to advantage; this suggests that there is something inherently wrong with being outside of the norm. Linguistic trends betray this line of thinking. In the United Kingdom, the Green Party was mocked when its Young Greens Women’s group used the catch-all ‘non-men’ for women and non-binary people. The term defined women and non-binary people in relation to men and linguistically centred men in the process. The resulting mockery stemmed from sincere outrage that women and non-binary people could be thus erased, for the sake of fitting simply into 140 characters. So much for autonomous spaces. Yet I have seen little outrage about the term ‘non-white’ being used to describe Black people. A quick search of headlines from the past year shows seven Guardian, four Independent and three Telegraph stories billed about ‘non-white’ issues, from fashion to literature. Thousands use the descriptor ‘non-white’ in the body of the article. (Of course, thousands also refer to people of colour, Black, or black and minority ethnic people.) At a glance, the stories are mostly positive and about diversity, yet through use of the term ‘non-white’ they unabashedly define ‘white’ as default. Like AWID panellist Awino Okech, I am inspired by the demonstrations of South African students in 2015 as they demanded recognition. Their continued insistence that their universities are decolonised – renewing a decades-old tradition of South African student activism – highlights systemic racism within higher education, from funding to the curriculum to the language of instruction. At the University of Stellenbosch’s Convocation in January 2016, alumnus Lovelyn Nwadeyi’s address, which switched seamlessly between English and “baie mooi” (very beautiful) Afrikaans, spoke to the role of language in oppression. She spoke to what it would mean for white South Africans to listen. The youngest alumnus to address the historically white university’s convocation, and the first black woman, Nwadeyi was making a bid to be elected to convocation, an influential statutory body. The 2,000 alumni present instead elected an all-white executive committee. 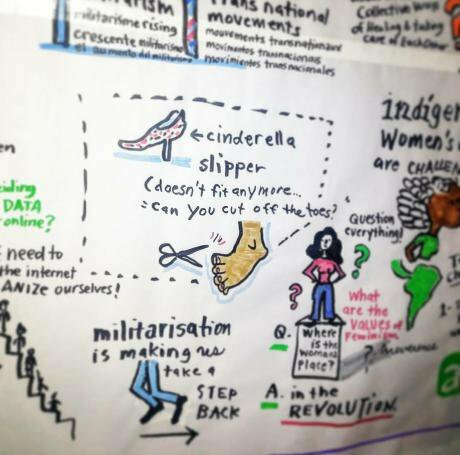 Instead of ascribing to patriarchal narratives and redressing the power imbalance on its terms, the AWID forum imagined something different altogether, and, as far as possible, modelled our feminist world. AWID had made a marked effort that this forum would be more inclusive than any before. 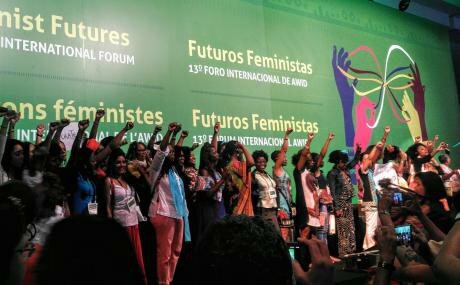 The opening plenary, for example, ended with a statement from the Black Feminisms Forum – which had met in the days preceding AWID’s International Forum – reminding AWID to remain intersectional over the coming days, and to recognise that “from Ferguson to Palestine to Brazil,” all Black lives matter. Following Audre Lorde, the forum certainly did not ‘assume any discussion of feminist theory without examining our many differences, and without significant input from poor women, Black and Third World women, and lesbians.’ Plenary panels not only included but were co-organised by Black and Indigenous women, disabled women, and lesbian, bi and trans people. Two hundred sessions were organised by grassroots groups from around the world. In the closing plenary of the AWID Forum, Tonya Haynes (founder of CODE RED for gender justice!) reflected on the moments throughout the forum when speakers and listeners had been forced to pause as they waited for sign language translation. “Working across differences requires this pause, this wait, this stillness.” Haynes defined the pauses as “productive” – “the source of rupture and transformation” which are crucial to challenge, inform and ensure the movement progresses together. As soon as the closing plenary had ended, a group of disability rights activists took to the main stage to insist that AWID must include women with disabilities on the board and planning committees. It was an appropriate demand which fitted with the forum’s intersectional themes and the overarching commitment that Rahila Gupta has already captured for 50.50. That AWID members are pushing for more is a mark of the forum’s success, not its failing. All images are by Ché Ramsden.